Spain is the life of the party. Throughout the year, there are numerous festivals and celebrations giving everyone another excuse to let loose. Out of all of these festivals, one of the main ones you don’t want to miss is Carnival. The Carnival festivities that occur towards the end of February and beginning of March are the wildest ones yet. These celebrations are a Western Christian tradition in Europe, and the country of Spain plays hosts to the best and biggest Carnival celebrations out there. 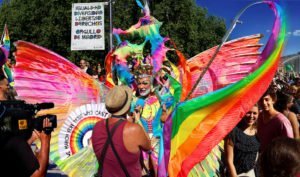 At this festival, you’ll see people walking through the streets of Madrid with very creative and fun costumes. The City Council of Madrid also has different free activities scheduled for everyone to enjoy. 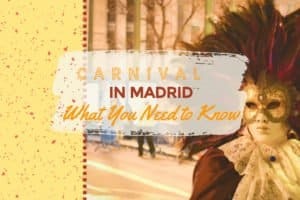 Madrid’s tradition of Carnival was temporarily wiped out when dictator Francisco Franco took control of Spain after winning the Spanish Civil War in 1939. Around 40 years later, in 1976, Carnival was revived and the joyous celebration returned to the streets of Madrid. This year Carnival in Madrid will take place between the 1st-6th of March and will offer a wide array of events in the neighbourhood of Prosperidad, near Parque de Berlin! The opening night of Carnival, carried out by the group El Aviador Dro, will start with a Pregón at Parque de Berlin around 8:00 pm on 1st of March. You won’t want to miss this opening night. Check all about the yearly Carnaval Parade, including when and where it happens. Following the opening, there will be several concerts in Berlin Park, after a welcoming warm-up from Carnival Radio. On the following day (Saturday, March 2nd), a costume parade will occur from 11 am – 1 pm. This parade will start at Berlin Park, will go through the area of La Prospe, and will finish in Berlin Park. The exact route of the parade is as follows: Berlin Park → Pradillo → Prince of Vergara → Cartagena → López de Hoyos → Stop at Prosperity Square → Nieremberg → Berlin Park. Following the parade a concert will be performed around 1 pm featuring pop-rock hits that are appropriate for the whole family. A costume dance and orchestra music will be featured later in the night (between 5:30 pm and 9:00 pm). On March 3rd (Sunday), the big events of the day will be Manteo del Pelele with dulzanias and other bagpipes from Madrid. Also on March 3rd, will be the Encuentro de Murgas and Chirigotas. These two activities will occur between 11 am and 12 pm. On March 5th (Tuesday), the II Festival of Comparsas Madrilenas will occur at 7 pm. Additionally, there will be several pop-up restaurants on the streets, so party goers can try some new food while out enjoying the festival. On the last day of the festival, the Burial of the Sardine will occur. This event starts at the plaza of San Antonio de la Florida. The sardine will be buried in Casa de Campo at the end of the procession. There will also be a bonfire to symbolize the ridding of negative thoughts. Many different bakers in Madrid have added to this tradition by recently created a “carnival sardine” treat. Different restaurants have their own spin on the treat, but you’ll be able to find the carnival sardine in over 60 different shops across Madrid during carnival. Last but not least, click here to read about Spain’s most popular carnival parties! If your are looking for a place to buy a costume at discount, check out Fiestas Paco, Madrid’s most costumes store in the city centre!